Our goal is to ensure the City of San Diego, the San Diego City Council and the La Jolla Community Planning Association represent the best interest of the La Jolla community while protecting individual private property rights of all La Jolla communiity residents. In the city of La Jolla there are approximately forty thousand (40,000) residents. Only eighteen (18) individuals (LJCPA Trustees) are recognized by the San Diego City Council to make 100% of the recommendations on land use matters to the City of San Diego for the La Jolla community. Astonishingly 99.99% of the residents of the city of La Jolla did not cast one vote to elect any of these 18 individuals. In a world where Facebook and Twitter are being used to change the governments of countries around the world, the La Jolla Association will (with your support) change the community planning process in the La Jolla community and perhaps the City of San Diego. No longer will only the voice of these same select few individuals make 100% of the recommendations on land use matters for the La Jolla community to the San Diego City Council and the City of San Diego, we all will! 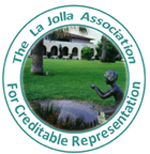 No longer when members of the LJCPA misrepresent or falsify a applicant’s contrasting vision for the future of the La Jolla community will it go uncontested by the residents of La Jolla. No longer should it be the sole responsibility of the planning group, not the City, to address alleged violations of Council Policy 600-24 by the LJCPA or it’s individual members. The La Jolla Association will ensure all our voices will determine the future of the City of La Jolla, not just a selected few. Register Today…. Change Tomorrow!